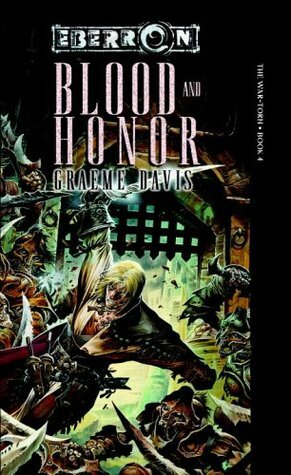 Blood and Honor by Graeme Davis is the last book in the Eberron game books anthology series The War-Torn. The series is very loosely connected in that each book features a protagonist that has survived the Last War, but has some trauma that still haunts them. In this case, that protagonist is Kaz Mordan, a veteran of the nation of Karnath, which is best known for embracing necromancy during the war and using undead troops. Now that the war is over, Karnath has tried to distance itself from these tendencies, which has caused many of the priests, necromancers, and intelligent undead to make their own plans to take power and remain relevant. And Kaz find himself in the middle of it, when he takes up the simple sounding quest to find his brother, who went missing towards the end of the war.Along the way, Kaz encounters an inquisitive (the local name for a detective) who's looking for some of the same clues Kaz is, a vampire, a shape shifting informant, an unscrupulous weapons dealer, a warforged (think fantasy robot or free willed golem) who cares more for his mechanical boat than living creatures, a local crime lord, a gnome agent of the Ministry of the Dead, and lots and lots of undead. Some of these are allies, some are enemies, and figuring out which is which is just one of the difficulties Kaz has to deal with. The book delivers on Eberron's setting of noir detective work and non-stop pulp action, with fights on airships, raiding secret strongholds, in military installations, and throughout the dark streets of a bustling city. Davis does a particularly good job of keeping things interesting, and having the book feel like it belongs in the Eberron world instead of simply a standard fantasy or Dungeons and Dragons setting. What's especially promising is that this is Davis' first novel. The fact that he's written or contributed to dozens of role playing game products explains how he fits the novel into the established Ebarron world, but I was still impressed with his freshman novel. Unfortunately, it doesn't seem that there are any more on the horizon that I was able to find. While I'm hoping to see more from Davis, I was very happy with Blood and Honor, and strongly recommend it for the mix of detective story and action in the always engaging Eberron world.